Chicago area law firm Momkus LLC today announces the naming of two new members and managing partners. 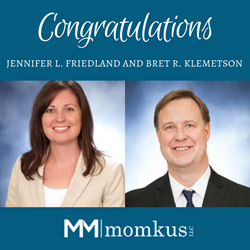 Jennifer Friedland and Bret Klemetson join existing members James Harkness and Edward Momkus. Both now join in ownership of the firm. Jennifer Friedland focuses on business, trust and appellate litigation. She has successfully tried both bench and jury trials, written and argued appeals before the Appellate Courts of Illinois and the U.S. Court of Appeals for the Seventh Circuit, and served as the Chair of the Appellate Law Committee of the DuPage County Bar Association. She graduated from the University of Kentucky and earned her J.D. from Tulane University Law School. She currently resides in Wheaton with her husband and three children. Bret Klemetson focuses on business transactions, such as buying and selling businesses and joint ventures, as well as other transactional matters such as entity formation and structuring, succession planning, executive compensation, shareholder and operating agreements and reorganizations. Bret takes a wholistic approach with his clients and calls on his CPA certification to advise on tax and accounting matters in business transactions. He is a graduate of the University of Minnesota and the DePaul University College of Law. Bret lives in Naperville with his wife and their two sons. Momkus LLC combines vast transactional and trial experience with a strong understanding of the needs of our clients to deliver optimal results. We care about the success of our clients both in the short term and long term, and our experienced attorneys tailor solutions to not only resolve the immediate issue but to minimize future complications. Our experience across a wide variety of practice areas gives us an in-depth understanding of the big picture, so we can identify any and all barriers to reaching your immediate and future objectives. Momkus LLC works to deliver creative, efficient and effective solutions to clients in the Chicagoland area, as well as nationally.